Fix the past. Save the present. Stop the future. 2080: at a remote site on the edge of the Arctic Circle, a group of scientists, engineers and physicians gather to gamble humanity’s future on one last-ditch experiment. Their goal: to make a tiny alteration to the past, averting a global catastrophe while at the same time leaving recorded history intact. To make the experiment work, they just need one last recruit: an ageing schoolteacher whose late mother was the foremost expert on the mathematics of paradox. 2028: a young woman goes into surgery for routine brain surgery. In the days following her operation, she begins to hear another voice in her head... an unwanted presence which seems to have a will, and a purpose, all of its own – one that will disrupt her life entirely. The only choice left to her is a simple one. Does she resist ... or become a collaborator? 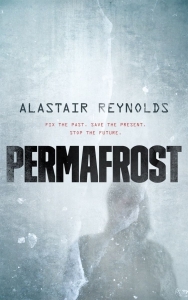 A post-apocalyptic time-travel adventure from master of science fiction Alastair Reynolds.